The science team will meet later on today and then they will brief Secretary Chu and Secretary Salazar. And the science team and Secretary Chu will make a recommendation on how to proceed. In the meantime we are continuing an over abundance of caution to make sure we have mitigated risks at each point prior to directing the intercept of the well and we will continue to do that. There does not appear to have been an update on Tuesday, from the Admiral; BP or the Secretary of Energy’s oil spill page which suggests that while the relief well will still intersect the original well, the precautions to be taken before that occurs are still being hashed out. So, while we are waiting, I thought I would mention the state-of-the-art in the plans that the major oil companies have put together to ensure that this large a disaster does not happen again, and then a short additional technical note about something that even I failed to note, during work on the BOP. • Fully contain oil flow in the event of a potential future underwater blowout. • Designed to address a variety of scenarios. • New Specially designed equipment (will be) constructed, tested and (will be) available for rapid response. • Can operate in deepwater depths up to 10,000 ft.
• Adds containment capability of 100,000 bd (4.2 million gallons per day), exceeding (the) size and scope of the Gulf spill. The intent is to have the initial system, which is expected to cost around $1 billion, in place in 6 months, with further improvements and expansions developed as they become available over the following year. The system takes the flow that is collected from the well, and then sends this, through separate risers attached to suction blocks, up to the surface for collection. There is an underwater dispersant system, and an accumulator, or power pack, to help provide additional power that may be needed. To capture the oil/natural flow from the well has to be a flexible system, given that each failure is likely due to a unique circumstance, and will have its own geometry. 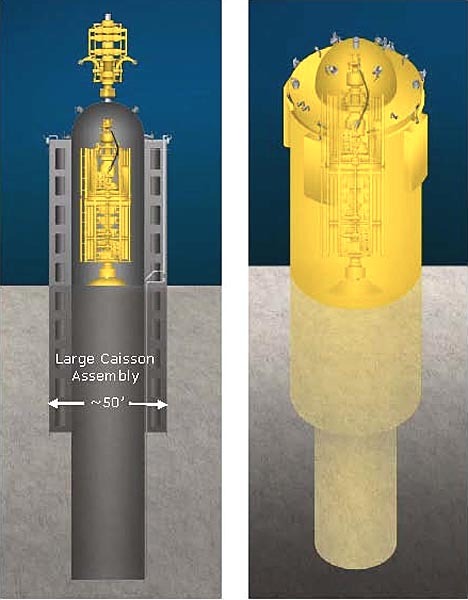 In all cases there will be a complete seal created around the well, but whether this comes from some form of containment that fits to the existing infrastructure of the well, or whether it requires that a separate caisson be created around the well, sealing into the surrounding rock; the equipment and protocols for its use will be available. 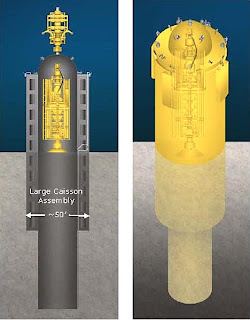 If there is a failure where the upper casings and liners of the well have retained their integrity, then, depending on what is available the new assembly (which will contain 3 shut-off rams as with the current stack, as well as flow lines for choke and kill circuits) can be attached either to the mandrel, the BOP, or to the riser itself. If the integrity of the end of the well is compromised (i.e. the rock fragmented, the liners broken or the wellhead destroyed in some way) then a different approach will be required. Here a caisson assembly will be constructed around the remnant BOP, large enough to surround the well at a point where the rock has enough strength and quality to allow a seal under the wall. This will then allow a cap to be placed on top of the caisson, with the containment system from the last slide, mounted on top of the cap, as a way of capturing the hydrocarbons that are bled off from the well, without their coming into contact with the seawater, and forming hydrates. In both cases the oil and gas recovered from the well will be sent up to the surface using the flexible risers that were planned for use at the Deepwater Horizon site, but were never used. The use of flexible risers allows these feeds to be moved away from the immediate vicinity of the well, to allow other operations. 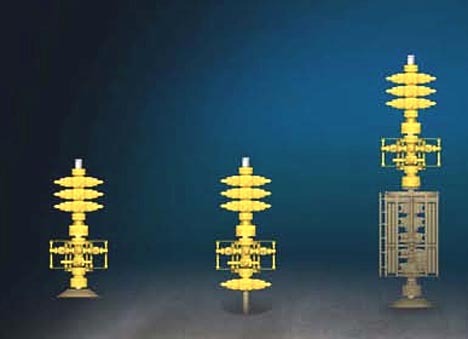 As with the surface vessels used in the present situation, the support vessels will be able to separate and flare the hydrocarbons, though the main intent is to be to flare the gas, while collecting and trans-shipping the oil. 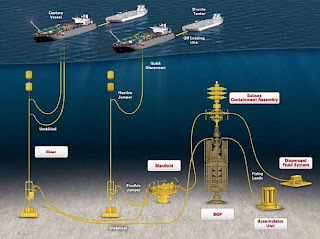 The system will be available and thus will require the formation of a separate organization, the Marine Well Containment Company, to construct, maintain and operate the technology, as well as to maintain expertise in the most effective use of it. And in closing, a small additional technical note. After the oil spill was being partially contained there was some problem with hydrate buildup on different parts of the BOP, and on the cap. I remember noting the ease with which one of the ROVs was moving a lance that dislodged the hydrate crystals, and thinking that they must have been very loosely attached. Turns out I was merely unobservant, the lance was an ultra-high pressure cleaning lance that was fed water at a pressure of 36,000 psi from a pump lowered to be adjacent to the operation. It was the resulting jet of seawater and liquefied gas that was actually doing the cleaning. There is a Youtube video for those who were wondering what that particular operation and structure were doing.